via mail to P.O. Box 72379, Oakland, CA 94612-8579. Encouraging the growth of more-flammable plants. It will also use thousands of gallons of toxic pesticides on steep hillsides where they can get into the watershed. It will release carbon emissions on a huge scale. This project is not only environmentally destructive, it is a huge waste of funds that should be used to actually reduce hazards, not increase them. Ask them to approve the No Project alternative. The first two projects (UC Berkeley/ Oakland Hills) will essentially clear-cut all the non-native trees in the projects areas: eucalyptus, Monterey Pine (yes, it’s “non-native”!) and acacia. This would be around 77,000 trees. They will chip the smaller trees and branches, leaving a mulch up to 2 feet deep on the ground. The larger branches and logs will be left unchipped. Pesticides – Roundup, Garlon, and Imazapyr – will be used to prevent re-sprouting and to kill non-native shrubs. They hope that native plants and trees will move into the treated areas, creating an oak-bay woodland. The third project (EBRPD) is slightly different, in that it proposes to “thin” the forest and cut down some 409,000 trees but leave around 60 trees per acre standing. It proposes chip the felled trees, spread the wood chips as mulch to a depth of 4-6 inches and burn the rest. It also plans to use prescribed burns to control the understory. Even though this has been positioned as a fire hazard reduction project, it is clearly targeted at native plant restoration – using Federal Emergency Management funds. All the management actions are likely to increase fire hazard. Those pushing this plan have emphasized the flammability of eucalyptus (which isn’t actually more flammable than most trees) but avoided the more important comparison: Will the landscape that will replace a felled eucalyptus forest be even more flammable? Those seeking a reduction in fire hazard – which is, really everybody – will find that instead the fire hazard has increased, as we’ll explain below. The Native Plant enthusiasts who hope that Native Plants and trees will recolonize the treated areas will be disappointed. There’s no plan to replant or to garden those areas; the only tools are a deep mulch of eucalyptus chips and non-selective pesticides. This article suggests that the most likely plant to move into such areas would be broom – which is non-native and considered invasive because it can actually deal with the kind of conditions that will result. Anyone who loves trees and the environment, which will suffer from the loss of carbon storage and pollution control, not to mention the beauty of the trees. Actually, most of the residents of the Bay Area. FEMA, which could have used the funds for competing projects that reduce, not increase, hazards. The taxpayer who will be paying for this anti-environmental mess. The worst of it is that it is essentially irreversible. If the planners realize that most of what the opponents say is true, they cannot grow back trees that took decades to become what they are now. They cannot sequester the carbon they’ve released. They cannot cure the people whose health has been adversely affected by pesticides. All they can do is declare victory and move on. Is there a potential win for anyone? Well, maybe. It will empower the people who will be giving out the contracts, and benefit the contractors who actually do the work and the pesticides suppliers. And UC Berkeley’s Long Range Development Plan calls for building 100,000 square feet of additional space in the hills. It would undoubtedly be convenient to have the tree removal funded by FEMA. The wood chips could take up to 20 years to decompose. According to the EIS, they have a “half-life” of 5 years, meaning that half of it will be gone in five years. A pile that’s 2 feet high would be 12 inches deep in 5 years, and 6 inches deep in 10 years – leaving a fire hazard there for decades. And there’s also the potential for subsurface smouldering fires that can burst out under the right conditions. Wind speeds will rise since the wind breaks provided by the trees would be gone. 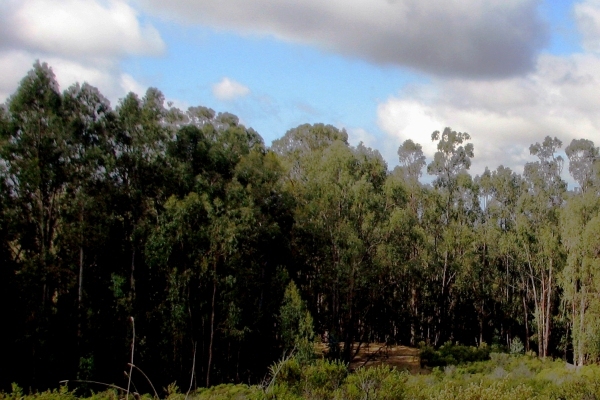 Fires in the East Bay are wind-driven fires, and eucalyptus and other tall trees actually fight fire by breaking the wind-flow. Even the EPA recommended preserving large and tall trees in place (according to Appendix K2 of the EIS). The replacement landscape will be more flammable. Removing trees will encourage grasses and shrubs, making for a more flammable landscape of faster-moving fires that can reach structures more quickly. The forest shade tends to inhibit the growth of these plants. The plans intend to encourage the growth of native plants – but doesn’t provide for planting or tending them. They assume that the existing seed banks and seeds from adjacent areas will grow there. Actually, it’s more likely that broom and other fast-growing non-native species will take over. When these dry out, they are much more flammable than the trees. In any case, the native chapparal is also very flammable. The loss of shade and the moisture harvested from the fog will make for a drier, more fire-prone landscape. The EIS suggests that the harvested moisture is compensated by the trees using moisture from rain, so the net amount of water is the same. This is just silly: the fog comes in California’s dry season, and provides additional moisture at a time when the landscape is dry and thus lessens flammability. During the rains, the landscape is green and not flammable. If some of this acreage does actually become oak-bay woodlands, as the land managers hope, there’s another problem: Sudden oak death, which is spreading through California and could provide dead trees as fuel. The EIS ignores this threat entirely. The Draft EIS significantly understates the effect on carbon sequestration. The trees will no longer store carbon; instead, they will be releasing thousands of tons of it into the atmosphere. But the EIS ignores the carbon stored in the branches, leaves, and roots of the felled trees, and in the soil. They also miscalculate the amount of carbon that will be released in the EBRPD section of the plan. They may have ignored 80% of the actual carbon emissions caused by the project. Increased wind speeds with the loss of wind-breaks will affect quality of life, and likely cause the wind-throw of non-targeted trees. If you have not yet done so, sign the Hills Conservation Network petition. It has over 5500 signatures already.